These are five things we learnt as the Super Eagles of Nigeria were beaten 2-0 by Serbia on Tuesday, March 27 2018. The Super Eagles of beaten 2-0 by Serbia in a friendly game and we have a couple of things we learnt from the game. Aleksandar Mitrovic grabbed a brace as Serbia beat Nigeria 2-0 in the game played at the Hive Stadium in London. Just like the game against Poland, the Super Eagles of Nigeria lacked creativity in the middle and that is because of the absence of a natural No 10. 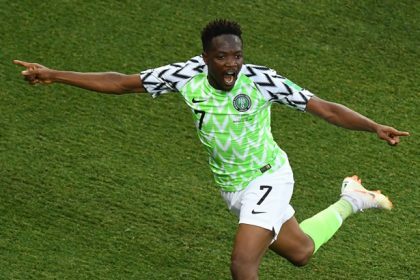 Captain Mikel John Obi has been the creative player in the team for a while and without him, the Super Eagles are yet to find a way to play without him. 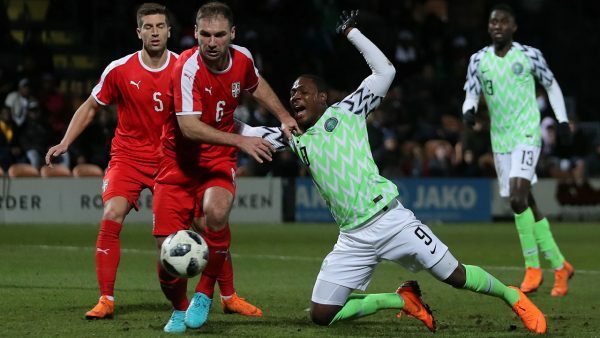 Against Serbia there was no creative player in the middle, Joel Obi who played in that role was too deep and was nowhere near the Serbian 18-yard-box to cause any problem. There is a clear need of a No. 10 in the Super Eagles squad even Mikel that the team has not been a No. proper No 10 for almost 10 years. This is a huge problem for the Super Eagles. Leon Balogun missing, the Super Eagles of Nigeria were without their ‘Oyinbo Wall’ central partnership of him and William Troost-Ekong and Chidozie Awaziem. Troost-Ekong and Awaziem didn’t particularly play very bad but they let in two goals to lose the game. There are some similarities between the last game they played together and this one. Against South Africa in June 2017, the central defence partners also conceded two goals as the Super Eagles lost the home game 2-0 in an Africa Cup of Nations (AFCON) qualifiers. 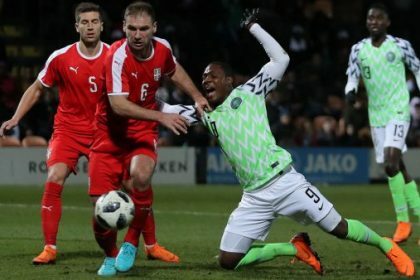 Just like the loss against Serbia, it was goalless at first half at the Godswill Akpabio International Stadium when Nigeria lost 2-0 to South Africa. Bad omen for the partnership. Victor Moses has had a bad season so far for Chelsea but even in his worst form, he has remained on the best players for the Super Eagles. He won the game for them against Serbia on Friday, March 23 and in Tuesday’s game, he was Nigeria’s most dangerous player. He looked threatening anytime he held the ball although it never worked out for him after he was replaced in the second half, the Super Eagles frontline looked flat. Since he breathed life back into Super Eagles 2018 FIFA World Cup qualifying campaign in the 4-0 home win over Cameroon in August 2017, Odion Ighalo is yet to score for the Super Eagles. He missed the two games in November and was silent in the 1-0 win over Poland on Friday. But his outing in the second 45 minutes showed that he remains Super Eagles best striker. Gernot Rohr went for pace in the first half with Musa, Moses and Alex Iwobi but Ighalo came on in the second half and was a menace to the Serbian defenders. He held onto the ball well, disturbed in the box and was very physical. He remains Super Eagles best striker. The Super Eagles of Nigeria have been in fine form ahead of the 2018 FIFA World Cup but they have been brought back to earth with his defeat. This 2-0 loss to Serbia brings about a slew of worries for Rohr, from his defence to midfield combination to his front-line. Among a pool of very talented players, he is yet to find the perfect mix that will deliver the results for him.